The ethos of mobile user experience (UX) has become narrow and indifferent to human needs. Today, designers boast about the “ease of use,” “intuitiveness” and “addictiveness” of their apps, as if these traits were worthy goals in themselves. I’d like to propose a more empathetic goal for mobile UX: earn the user’s respect. To do this, we must build mobile experiences around stories. Mobile UX does not happen on a smartphone or tablet. It happens in a moment, at a time and place where an individual has specific needs, wants and problems that mobile technology can address. By changing the outcome of a story, mobile UX creates a relationship with users. Their initial surprise matures into joy, trust and, eventually, respect. The less buttons and menus in your user interface (UI), the better the UX will be. The UI is like a skeleton. In an average person, bones account for about 12 to 15 percent of body weight. If you cranked that up to 50 percent, people would be immobile or clumsy. The same goes for UI. Give it enough mass to provide structure, but don’t let it paralyze the experience. An outstanding example is WhatsApp, which now handles 30 billion messages per day, making it 50 percent more popular than traditional text messages. This dwarfs Twitter’s 500 million Tweets per day. Like its predecessor SMS, WhatsApp has an epically barebones UI, designed to do nothing but message and call people in a minimal number of taps. Plenty of apps can do what WhatsApp does, but none are as minimalist. In the future, we’ll see innovators cut back UI by building more intelligence. Consider self- driving cars: one day, automation will eliminate the need for a steering wheel, gas pedal and rearview mirror. AI will simplify the UI of the car yet improve the experience. Digitally and physically, mobile UX should invoke motion. Users should navigate the experience using expressive gestures, and content should be interactive. Tinder is a perfect example (Yes, I’m married, but as a UX designer, I had to test it). Tapping the green or red buttons is much less gratifying than swiping left and right. Swiping invokes a feeling of speed and self-assurance. Yes! I’d love to meet this person. No! Take these bathroom-mirror selfies out of my sight. Swiping makes users feel like they’re moving towards a match rather than sitting in an office chair. Google Maps is also an exemplar of motion. When you enter an address, Google first zooms out to a birds-eye view of your journey. You see the overall route, and then with ‘pinch’ or ‘push’ motions, you can zoom into specific parts of the trip. Consequently, you trust that Google will guide you to the right place, along the most logical route. The UX on iOS and Android should be consistent, but the navigation patterns should be different. If you build iOS patterns into an Android app, or vice versa, you will piss people off. To avoid this mistake, pick some popular apps and study how they differ on iOS and Android. For instance, you’ll notice that most Android apps have a drawer menu while iOS apps have a tab bar at the bottom. If you throw a tab bar at Android users, they’ll feel like Americans driving in London for the first time. The TED app illustrates how patterns can go awry crossing between iOS and Android. On an Android phone, you’ll see Surprise Me, Featured, All Talks and My Talks across the top of the screen, on a menu that awkwardly slides side to side a few millimeters because it’s too wide. On the iPhone, these same menu options appear along the bottom tab bar without issues. It seems that TED tried to duplicate the iOS tab bar at the top of the Android app, with odd results. At the same time, the Android version has filters for New and Popular that you don’t immediately see in the iOS version because their hidden behind a nonstandard icon that combines an up arrow and down arrow. TED Talks rock, but their mobile UX isn’t consistent. Follow some design norms to create basic comfort and enjoyment. Within this artistic boundary, you have unlimited space to get creative. If you really need to diverge from the patterns, it’s important to know the rules before you break them. Fortune 500 companies may have thousands of different web and mobile experiences. Often, they are oddly different from each other, but not necessarily distinct from competitors’ apps. 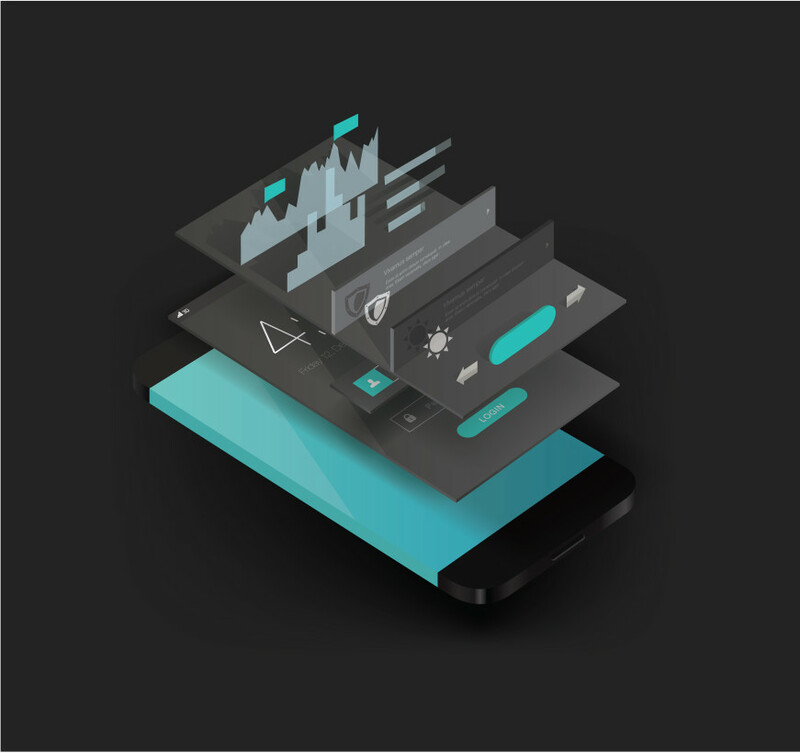 To unify yet differentiate your app portfolio, create your own design language. Think of design language as the rules for creating an app under your brand. Sure, colors, buttons and gestures should be standardized. More importantly, the flow of the UX should be consistent. In other words, if I know how to you use your music app, I should be able to use your payments app too without any confusion or handholding. Curious to see what a design language looks like? Take a look at IBM’s Living Language or Google’s Material Design. You’ll notice that they both carve up their languages into frameworks with discrete categories. IBM’s includes guidelines for experience, visual, interaction, animation and front end design. The key is that design languages have both qualitative and quantitative rules. Is your user traveling on the subway or sitting at her desk? Is he on the couch at home or getting in the car? When you imagine the context, you can design for the moment. Consider these two Uber scenarios. One user needs a ride home from the bar at 2 am on a rainy night. Another user just landed in Miami and needs to rush from the airport to a sales meeting. The partier can tap “Set Pickup Location,” say goodbye to friends and leave the bar once he knows that the driver has arrived. He won’t get soaked in the rain. The businesses traveler can open Uber and tap for a ride as she’s walking out of the gate. She can skip the taxi line, arrive at her meeting on time and rush out of the car, without swiping a credit card. Uber seems to be designed for many different travel moments. The task of hailing a driver is secondary. Start creating mobile experiences to produce surprise, joy, trust and respect – in that order. You can’t measure these quantitatively. You can’t brag about them in your marketing. But when all you’re aiming for is a little bit of respect, mobile UX becomes less about technology and more about empathy. Ultimately, mobile UX is just a reflection of values. What do your apps say about your brand?